It’s always nice to hear a song that’s over 50 years old and which still sounds as cool as the day it was recorded. 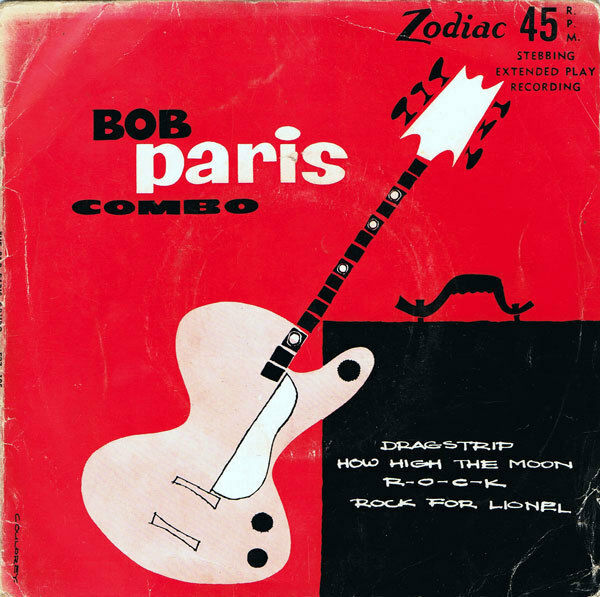 The wonderful Bob Paris wrote this guitar instrumental, on which he trades riffs with saxophonist Bill Fairs. There are no lyrics, but as soon as the tune kicks off, it’s easy to picture a guy in a leather jacket sliding into a 1950s hot rod and burning up the tarmac. Geoff Chunn was an early drummer with Split Enz; his brother Mike Chunn stayed in the band as their bassist even longer, eventually moving to the UK with them. Once the brothers were reunited back in New Zealand, they relished getting back to some straight-up rock in Citizen Band. This song is certainly not the first to use the metaphor of love as automobile, though Geoff’s lyrics have some good fun with the idea, as in the line “there’s more to life than being driven out of your brain.” The phrase “come and come get you” works as a pun on the VW Karmann Ghia. The chorus of this song has all the energy of a car going too fast, with hectically changing, slightly dissonant guitar chords that suggest there’s danger in the air. The lyrics in the verse are all about the girl that is bringing on this nervousness in the narrator, like a car racing out of control. The feeling of speed is hammered home by the music video, which features the band tearing through the Lyttelton Tunnel on the back of a truck. This song doesn’t mention cars or driving, but it immediately springs to mind through being used on a TV ad for the Europa oil company in the late 1980s (a New Zealand company that was eventually bought out by BP and disappeared a year after this ad was aired). It was written by Murray Grindlay, but became a signature tune for local blues legend Midge Marsden, who recorded it on three separate occasions. NZ On Screen has made available the more heartfelt, bluesy 90s version, but it’s also fun to look back at the original TV ad and marvel how it was that the American bluesman, Stevie Ray Vaughan, ended up being involved. The quality isn’t great, but it still looks like the three of them were having a pretty good time on the road! This song does a nice job of capturing the mood of a teenage crush, with the narrator being driven home on a rainy night and not wanting the journey to end. With a simple set of chords it mostly relies on the vocals and sparse production to give it some emotional heft. Bic Runga seemed to arrive fully formed on the local music scene. In fact, she’d already come third in the Smokefree Rockquest (in a duo, Love Soup) and released a less successful single (‘Bursting Through’). But it was this song that announced her as a star on the rise and she went on to achieve 7x platinum sales with the chart-topping album that followed. Dei Hamo had already been performing as a hip hop artist for over 15 years when he released his own solo album, First Edition (2005). This track was recorded at the last minute with the specific intention to write a hit single to launch the album. He certainly wasn’t the only hip hop artist to write a rap for the “riders” (Tyree would come out with his track ‘Ryders’ the following year and there are too many overseas examples to mention), but the lyrical flow on this track is immaculate, the hook is strong, and the punch lines are hilarious. Of all the tracks on this list, this would be the one that you’d want to crank if you were driving a dope car up Queen St on a Friday night. This track by The Drab Doo-Riffs packs the same rock and roll punch as the Bob Paris tune that started our list. This time there are lyrics to make the subject matter clearer, but they’re fairly meaningless. Instead, it’s the pounding drums and reverb-riffing guitar that brings the sense of propulsion. Like ‘She Speeds’, it really seems to be about a girl: “Hey bazooka, she’s a motorscooter, Vespa, Lambretta, don’t you wanna get her?” And yes, that’s Karl Steven from Supergroove singing. When Liam Finn sings about burning up the road, it’s pretty clear that he’s talking about being on tour. He certainly has clocked up plenty of miles on the live circuit in the USA over the years. Here he is thinking about his missus back home and is set on staying true to her: “In this world of beautiful girls, I look at the menu and always eat at home.” The official music video fits the theme even better, with Liam Finn in a futuristic CGI motorbike race but the power riffing of the song is far better represented by this live version. It’s odd to think that the USA has such a massive market for commercial country artists, given that this style of music doesn’t make much of an impact here – at least not in the main centres. In fact, the largest regular event on the local calendar is the Gold Guitar Awards in Gore. Therefore it makes sense that one of our finest country songwriters, Mel Parsons, would emerge from the West Coast of the South Island, rather than from one of the main cities. And it’s also no surprise that she’d be looking for a “driving man” to get her around – there aren’t many public transport options out there on the wild coast!